Health Facilities Group appreciates that renovations and additions require the ability to artfully integrate existing infrastructure into newly imagined spaces. With patient health and welfare on the line, the medical field also necessitates complex project phasing in order to preserve functionality during construction. By maximizing the potential of existing structures, HFG helps transform aging infrastructure into a launching pad for new construction. HaysMed is the primary provider of tertiary care in the high plains of Western Kansas. When HFG was hired for a multi-phased, 70,000 SF addition to a medical and administrative office building, our Master Plan of the existing facility was able to save HaysMed $100 million compared to a previous plan prepared by a well-known, very large architecture firm. HFG achieved these savings by demonstrating that renovations and additions to existing structures could accommodate the functions of a proposed new surgery center and patient tower. By recognizing that older infrastructure need not always be a liability, HFG brought this hospital system updated facilities for a fraction of the alternative project cost. Major Additions and Renovations: This multi-phased project consisted of a 70,000 SF addition to a medical and administrative office building with client education spaces, major renovation of the Obstetrics/Gynecological department, addition of a Women’s Breast Care Center, a major renovation and addition to the Dreiling Schmidt Cancer Institute, and a comprehensive overhaul of the site and parking areas. Through our Master Plan of the existing facility, HFG was able to save $100 million from a previous plan that was given to the administration by a well-known, very large architecture firm. Dreiling Schmidt Cancer Institute Additions and Renovations: The 13,871 SF expansion and renovation to the HaysMed Dreiling Schmidt Cancer Institute included additions and renovations for the new medical (infusion) and existing radiation oncology clinic. Additions include two permanent expanded waiting room spaces, eight new medical (infusion) oncology stations with exterior views, education rooms to support group functions, a hospitality station, and private check-in/check-out spaces. To accommodate the varying needs of patients, half of these oncology stations are arranged in an open plan style and the other half are enclosed to provide privacy during treatment. As part of the renovation work, patient access areas were consolidated and radiation oncology exam rooms and nurse stations remodeled. 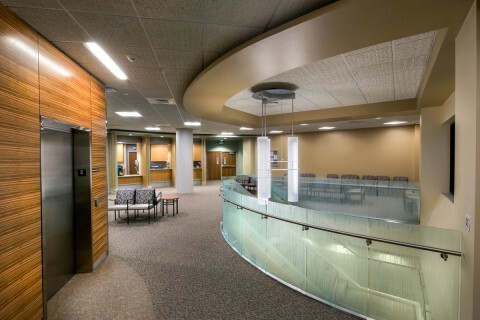 HaysMed Family Medicine: This 25,000 SF addition/remodel included partially frosted glass partitions and divided check-in areas in order to preserve patient privacy while still allowing staff to see patients entering the facility. As part of a comprehensive care plan, the design features positions for Patient Navigators to guide patients through relevant information without causing stress. The enhanced clinic includes ADA accessible Exam Rooms, Minor Procedure Rooms, a Laboratory, specimen collection, and X-ray space. Additional Projects: HFG’s other projects include a 6,000 SF interior remodel of the Pediatric Clinic, a Campus Code Study covering 500,000 SF of building space, a 10,000 SF Geri-Psych Renovation, Emergency Department, Servery, OBGYN Department, OB Clinic, Main Entry / Surgery Waiting Area, Breast Care Center, and Medical Surgical Patient Room Remodels.